Visit our partner, The Relate Project. Buy bracelets supporting one or more non-profit projects in Africa. After a recent visit to the Cape Town headquarters of Relate by our Product Development Manager, Judy Poliva Katz, we fell in love with this 100% not-for-profit trust started by Lauren Gillis for a dual purpose. First, the creation of these beautiful handmade bracelets provides work opportunities for elderly people living in the townships of Cape Town—people who have very few job opportunities yet are often the sole supporters of their families. Second, money raised through the sale of the bracelets goes toward critical causes all over Africa such as child education and welfare, human and animals feeding, diseases treating, animal protection and clean water initiatives. The Rotary SafeWater Project provides safe, clean drinking water to disadvantaged communities all over Africa. Run by the Sea Point Rotary Club, funds raised go towards purchasing and distributing portable water purifiers that effectively remove bacteria and parasites from contaminated water. This significantly impacts on the incidence of diarrhea, the biggest killer of children in Sub-Saharan Africa. Save the Elephants SA/Elephants Alive are on a mission to ensure the long-term survival of the African elephant and their habitats, and to promote harmonious co-existence between elephants and man. Their quest involves delivering research solutions that acknowledge elephants as an integral part of the ecosystem they occupy. 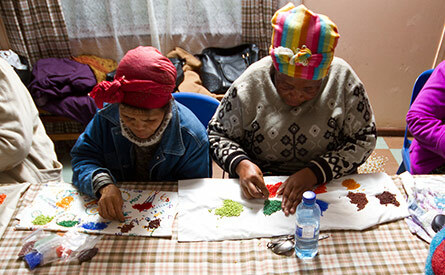 Ikamva Labantu is a leading South African non-profit which aims to empower poor communities to become self-sustainable. Their programs range from supporting orphaned and vulnerable children to HIV education, testing and support programs, as well as supporting the empowerment of women through education and communication projects and more. Ikamva Labantu's local township senior clubs provide the majority of Relate's workforce—elderly men and women who thread the beads for Relate bracelets. Want to help? Buy your own Relate bracelets, choosing from dozens of non-profit projects to support with your purchase, and Relate will ship them to you.